Tasha Lewis, “Swarm,” in situ at the Philadelphia Art Alliance. 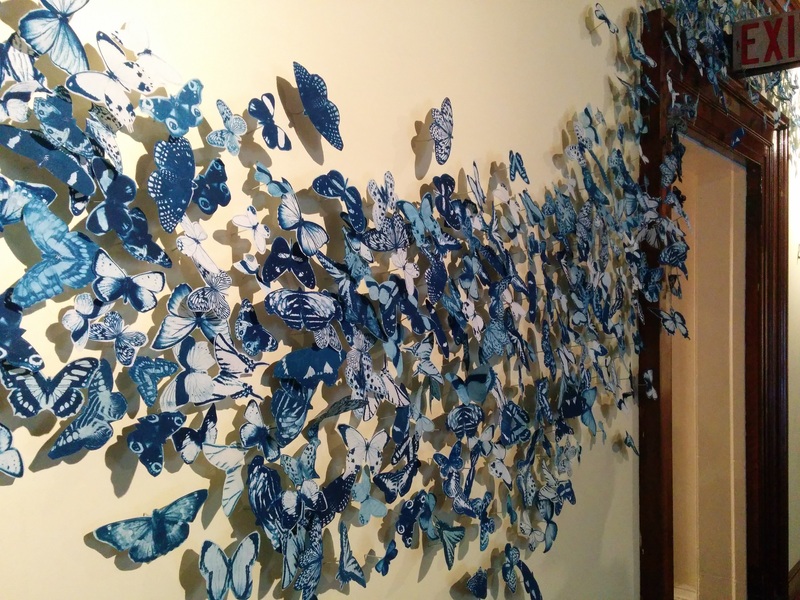 At the top of the grand staircase in the Wetherill Mansion, a stream of fabric butterflies carefully pinned to the walls seems to spill out of the galleries. Fittingly, the work is entitled “Swarm” and is part of Tasha Lewis’s installation for A Curious Nature. Lewis created these brilliant indigo butterflies using cyanotype printing, a method originally developed in the 1800s to produce blueprints. Entering the gallery, visitors see the technique in a number of other pieces–“stuffed” animals, many that same brilliant blue, entangled in plexiglass planes and bell jars, as well as fabric-covered cardboard animal skulls, some embellished with beads, that hang upon the wall like so many trophies. What emerges from the grouping is a clear allusion to the 19th-century preoccupations of photography and taxidermy that is simultaneously rooted in our present technological and social moment. Lewis (B.A., Swarthmore, English Literature and Studio Art, 2012) started out as a photographer. Seeking new ways to develop film, such as Van Dyke brown prints and the aforementioned cyanotype, she began to print on cotton. 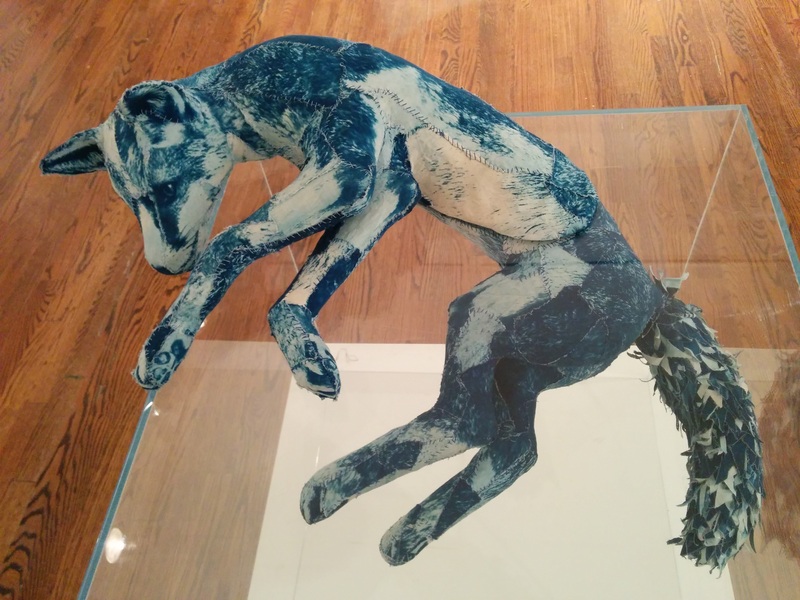 One of her earliest mixed-media works using cyanotype on cloth is “Fox;” it also remains one of her most gripping. The fox in question is partially submerged in a plexiglass box. Suspended between freedom and entrapment, looking simultaneously at rest and defeated, the figure invites me to project my own stories onto it while still challenging any given narrative. With its closed eyes, downturned head, and languid pose, the fox brings to mind my own pet; its facial expression could be seen on any domestic cat or dog, those wild things we attempt to train and keep at home. Lewis is posing questions of agency–can the animal be alive and escape? While these works, including “Fox,” riff on taxidermy, they move beyond it as no creature is fully imprisoned by its glass cage. Lewis’s use of glass and plexiglass points to the practice of taxidermy and to those institutions that frequently housed specimens–museums. Although variations of the technique were practiced in the ancient world, taxidermy as we know it came to prominence in the early 1800s; over time scientific approaches and accuracy became increasingly important. It is hardly surprising that the same century saw the foundation of major museums–the American Museum of Natural History in New York city was founded in 1869 and Philadelphia’s own Academy of Natural Sciences was established even earlier, in 1812. As humans sought to document and control the natural world, they put it behind glass and invited the public in. 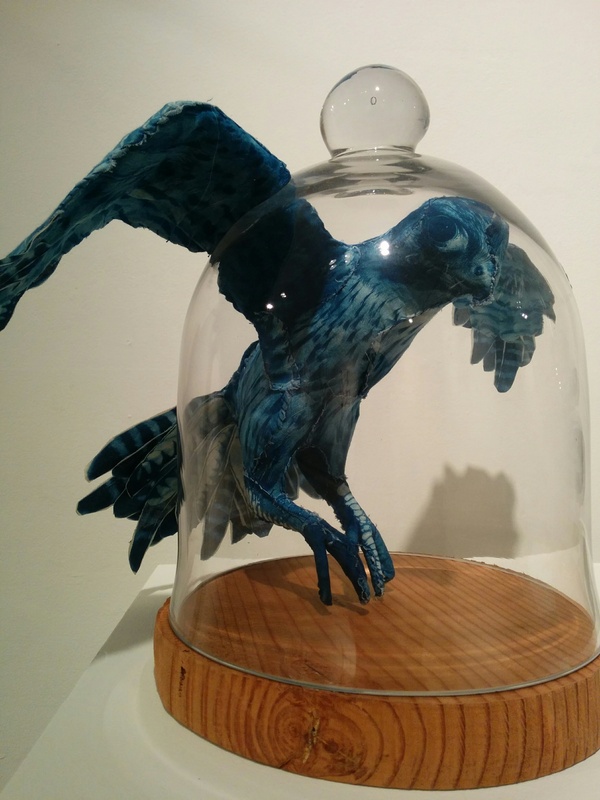 Yet Lewis’s animals are only partially contained, and the use of glass introduces an additional awareness of space. It reminds me of the glass plates so often employed in scientific endeavors–microscope slides, sample management, display, and dissection. 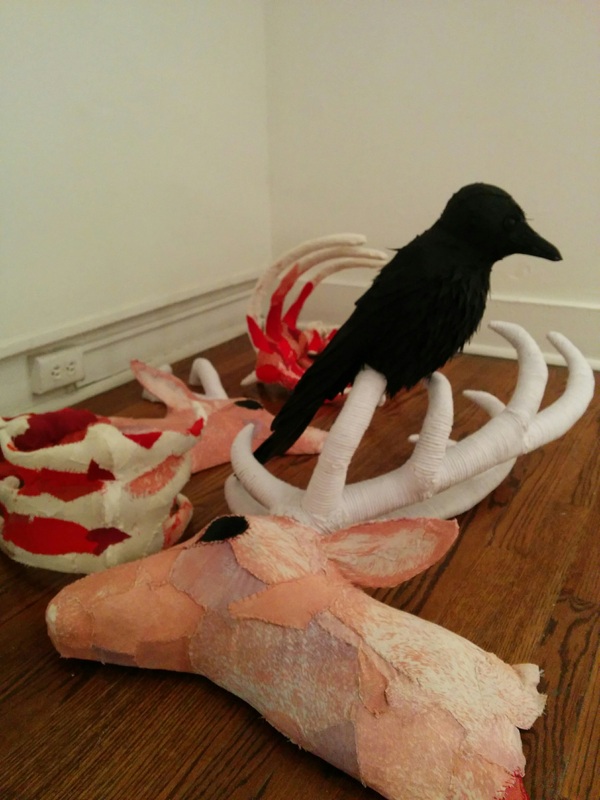 And indeed, dissections of a sort are occurring before the audience–few animals in Lewis’s installation can dream of being whole and unmarred; nearly all are divided or reduced to pieces of their former selves, whether the stuffed animals or the animal skulls adorning the walls, whose antlers actually detach from the skull. The sole exceptions are the ravens circling the carcass, crafting dissections of their own. Tasha Lewis, “Carcass,” 2015, in situ at the Philadelphia Art Alliance. And yet, despite all the references to the 19th century, Lewis’s work is firmly placed in the present, particularly in terms of access and open sourcing. Much of the material employed for the sculptures is readily available, such as cotton, cardboard (used to make inner frames), and cord. Internet users can watch Lewis transform these mean materials into art on her website, where she documents her process with videos, photos, and descriptions. “Swarm” was initially developed as a traveling sculpture, with the butterflies moving with Lewis to be photographed in various cities. This spawned a collaborative project entitled Swarm the World, wherein people across the globe would request these butterflies, install them in their own towns and then photograph them–the evidence of which can be seen on this tumblr page. Juxtaposing this idea of access with the animal sculptures raises an important question: is this why we seek to control nature and its creatures to begin with? We trap them in efforts to bring them closer, to see, touch, and enjoy? Lewis’s work reminds the audience of the challenge–to honor the wildness and wholeness too, even while holding it close.